Dog Training Classes can be found all over the country and will train you in the management of your Vizsla. Attendance at dog training, after innoculation, will also ‘socialise’ your puppy and ensure it learns to enjoy the company of other dogs and people, under your control. If you intend showing your puppy, you will also wish to attend Ringcraft classes, where you will learn the rudiments of handling your Vizsla in the show ring. For both Ringcraft and Dog Training, do remember, that practice may not promise perfection but it will go along towards it. 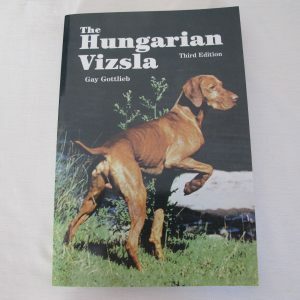 Your Vizsla is no different from any small creature, be it animal or human – it needs food, warmth and love; the latter includes discipline. Never confuse discipline with chastisement: discipline is about learning and training, whereas chastisment is about punishment. If you get the training right, your Vizsla will learn to fit in with your life and you will never need to chastise it. Simple commands will suffice, preferably of one word and syllable – eg SIT, DROP, DOWN, NO! LEAVE, STAY etc., followed by ‘Good dog!’ or ‘Well done!’ and a titbit as a reward. As with children, canine discipline requires a calm attitude and consistency of approach. The main focus should always be positive and reward the good behaviour. Coat – a very attractive aspect, not only for its beautiful ‘Russet Gold’ colouring but also because, being short-coated, it is relatively easy to keep clean compared with some other breeds. When your Vizsla’s wet, a quick towel down will leave him almost dry whereas, if he’s muddy, somewhere warm and comfortable to lay – perhaps on newspaper – will see most of the mud drop off when it’s dry. To keep his coat gleaming, a brush down daily with a ‘velvet’ grooming glove will work wonders. In the spring he will start to shed his winter coat – often a lighter colour – to reveal the lovely rich colour coat he wears in the summer, when a daily brush with a horse (or human) brush will help the metamorphosis. Claws – need clipping on a regular basis. It is easier to learn to do it yourself as vets do not always take off enough. The old adage about claws being worn down by walking on pavements etc doesn’t always work. The Vizsla should have thick fleshy pads: this means his claws can grow too long if they have to touch the ground in order to be worn down. So, continue the nail clipping that your pup’s breeder should have started, on a weekly basis, so that he becomes used to the routine and will sit quietly as you do it. If he struggles, you may cut too short and make the claw bleed. This is painful and will lead to the pup refusing to let you clip his claws again. Be firm and kind and reward good behaviour. Lead training – The final part of the early learning process is lead training. This should be done in the garden while his vaccinations are taking effect. Make sure you never drag your Vizsla by the lead. Remember that all training must be a positive and happy experience so, if he digs his heels in and refuses to move, don’t forget the food! A piece of cheese will work wonders! EARS – they should be sweet-smelling and clean in appearance. Usually they are. A wipe with tissues is usually enough to keep them clean and a cotton bud may be used very gently on the inside of the outer ear flaps. However, NEVER insert a cotton bud down into the ear for fear of perforation of the drum. Your dog will jerk his head quite vigorously if you attempt to do this, perhaps with catastrophic consequences so, NEVER EVER DO IT! At any sign of a discharge or unpleasant odour, make an appointment to see your vet. Teeth – chewing on raw marrow bones will keep them sparkling. There are also many biscuits brands on the market, designed with canine dentition in mind. Do remember, however, these have a calorific value and an abundance of any ‘food’ will inevitably lead to an increase in weight over time. Many propriety brands of tooth-paste are available and most dogs will permit their owners to brush their teeth clean, particularly if you make it a pleasant experience.9) Will clean up after their dogs in public places or anywhere their dogs are being exhibited.